I am not a professional photographer, obviously. I take photos of the things around me. My kids, my dog, my house. I go for walks at lunch and take shots of the area around my office. The photographic cliché is not unfamiliar to me. This is the biggest one of them all, a kid and a dog. 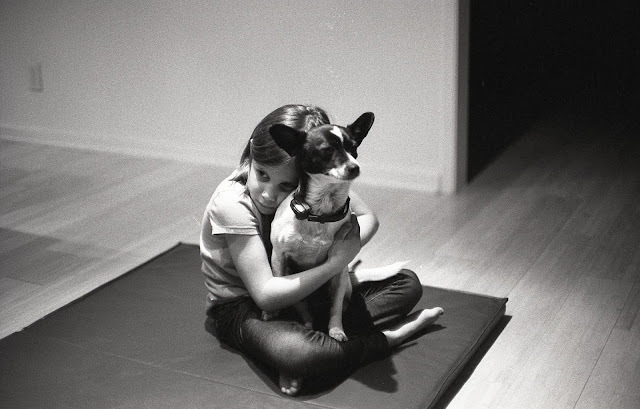 Of course, to me it is a cute kid and a cute dog, 'cause they're my kid and my dog. Looking closer though, there's a lot to this photo besides that. I love the creamy tones, the deep shadow in the upper right corner, the way the light is coming from above but is bouncing around off the light colored floor to illuminate Shea's face. I also like the way the light falls off on the left side. I haven't decided yet if I like the power outlet on the wall... I may crop around that, but then I lose the falloff. I centered the subject, and I've been told that's not a good idea. I like the way it works in this one. I just plain LIKE this shot. 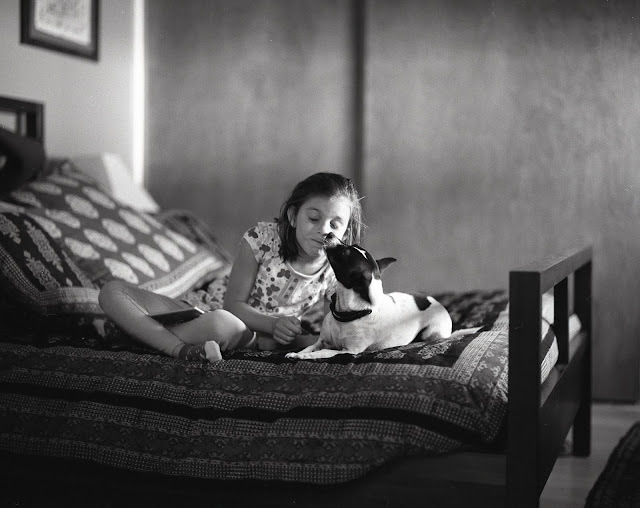 I shot this with a Pentax Spotmatic, a 50mm 1.4 lens and Kodak Tri-x 400 film. This particular Spotmatic is one of the cameras that was 'not working' when I bought it. 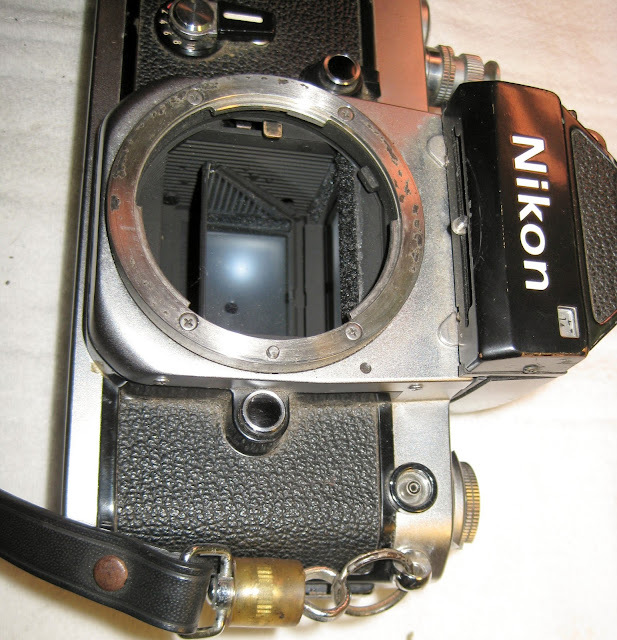 I cleaned it up, replaced the light seals and repaired the light meter and got it working. I actually have a silly number of Spotmatics. I have both my Father's and my Grandfather's, both of them chrome, both of them cleaned, lubed and re-sealed. I discovered after poking around that there are black Spotmatics, and of course, I had to have one. I bid on one that was for a silly low price and won it. When it arrived I realized that in typical auction rookie fashion I had not throughly read the auction. It is a Pentax SL, not an SP. The SL doesn't have a built in light meter. 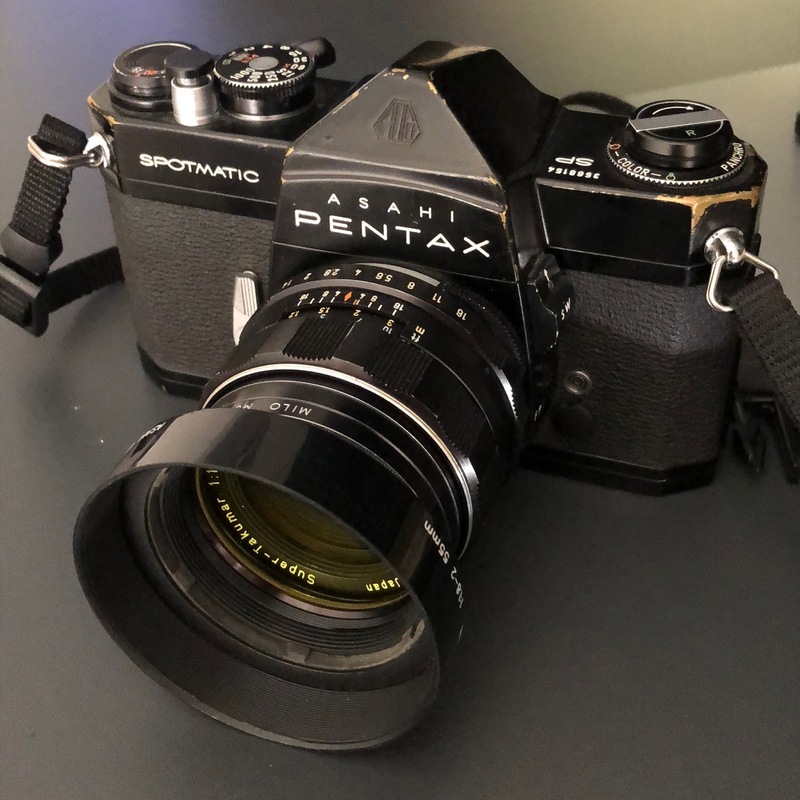 As it turns out, I've subsequently learned that black Pentax SLs are pretty rare, and it is probably worth more than a metered body. Regardless, I wanted an SP. I bid on one on an online auction and, thinking I would certainly be outbid, saw one with a 'buy it now' for the same price and bought it. I subsequently won the auction, so I have two of them now. I also discovered that people sell Spotmatics as 'broken' when all they need is a good cleaning, and that they sell for NOTHING, so I ended up buying a whole bunch of them and repairing them. I've sold off two of them, but I still have rather embarrassing number of them which I need to sell off. Clearly I'm much better at buying than selling. I shall also continue to take the cliché photo whenever the opportunity presents itself. Just wait 'til I start sharing my photos of trees.